The Hon’ble Ambassador of Georgia Mr Archil Dzuliashvili and Hon’ble Ambassador of Latvia Mr Artis Bertulisu were warmly welcomed home to Parmarth Niketan for the divine Ganga Aarti ceremony recently. During their visit, inspired by the emphasis to protect and conserve our environment, they shared that Latvia is the second greenest country in the world and that Georgia has more than 22,000 water-bodies and is home to the beautiful Caucasus Mountains. 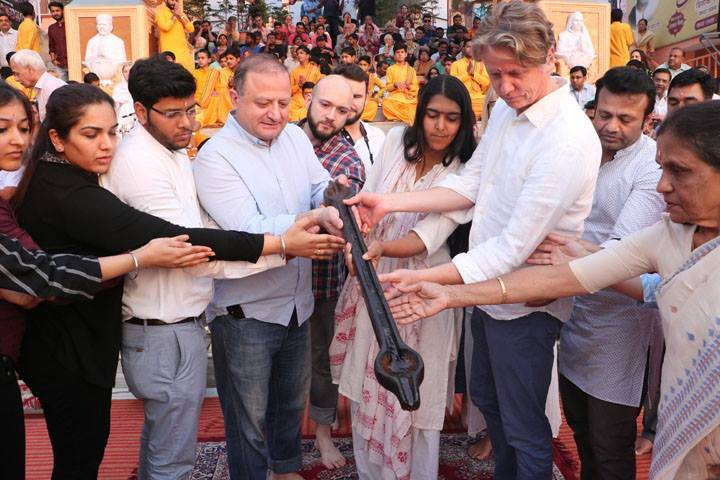 Mr Archil Dzuliashvili spent some time before the Aarti touring the Ashram premises and learning about the unique initiatives undertaken by the Global Interfaith WASH Alliance and its other sister organisations to improve water, sanitation & hygiene. Mr. Artis Bertulisu arrived a bit later with his family for the evening ceremony. Both of the Ambassadors offered their support and inspired everyone to be Ambassadors of their Communities, starting by planting trees and taking care of their communities. They took part in a special water blessing ceremony and received sacred Rudraksha saplings to plant back at their respective embassies. They were also warmly invited to join for the International Yoga Festival next year from 1-7th March and plan to come back again very soon.